The beautiful flavors of sweet potato and cauliflower come together easily in this quick and easy dish. With very few ingredients and a cinch to make, this is a wonderful side dish or entree. Since it was raining all day, I wanted something comforting and warm but not too filling. I went through the fridge and came up with 1/2 a head of cauliflower and saw the oranges. Viola! The flavors of the orange zest and juice give this dish a lovely fresh aroma and flavor. 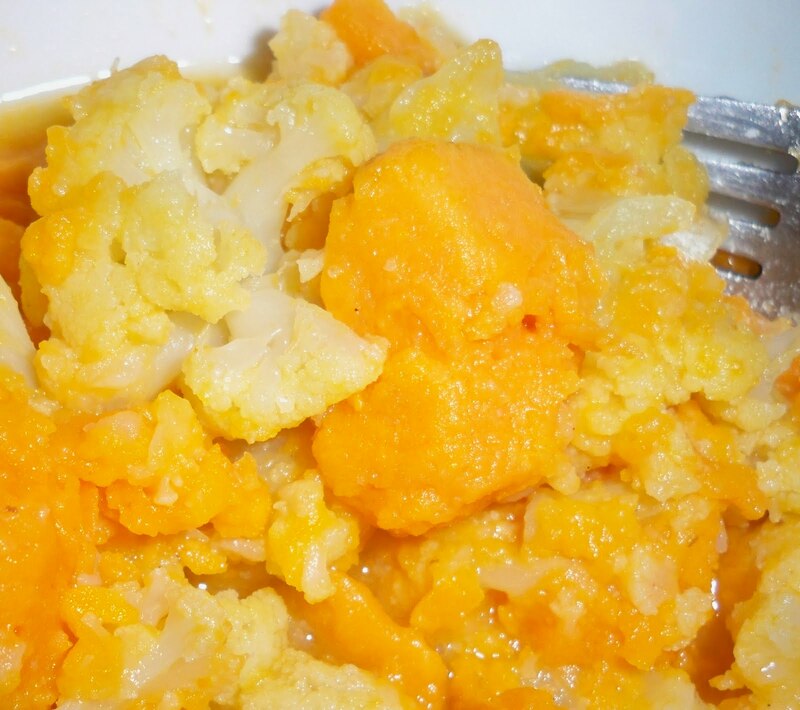 The yams add a lovely sweetness and the texture of the cauliflower is wonderful in this dish. And don’t forget how beautiful the colors are, making it even more appetizing. 1. Add cauliflower and potatoes into a pot with a 1/4 cup water. Let them simmer for a few minutes until tender. 2. Add all other ingredients, mix and let simmer until desired tenderness. I like my cauliflower tender so I tend to cook it a little longer. It’s that easy. If I had any onions, I would have added them as well as a little broccoli. Switch things up and try new veggies. The orange zest gives the kitchen a lovely aroma. This recipe comes from my good friend, Ross. He brought it to a geography class and I fell in love with it. I hope I’ve followed his recipe. If not, it’s still great either way. This takes a little time to make, but most of the time is spent simmering and it’s not hands-on, leaving you to do other things… read, watch TV, play a game of backgammon, clean the kitchen, etc. I’ll leave it up to you. But be warned, you won’t be able to stop eating it when it’s done. But it’s low in calories, so eat up! 1. Cook onions in a large sauté pan in 1 Tbs olive oil until soft. 2. Add cabbage and stir. The pan will be full, but the cabbage will cook down. Cover and let the cabbage cook for about 10 minutes. 3. Add all other ingredients to pan, stir, and cover. 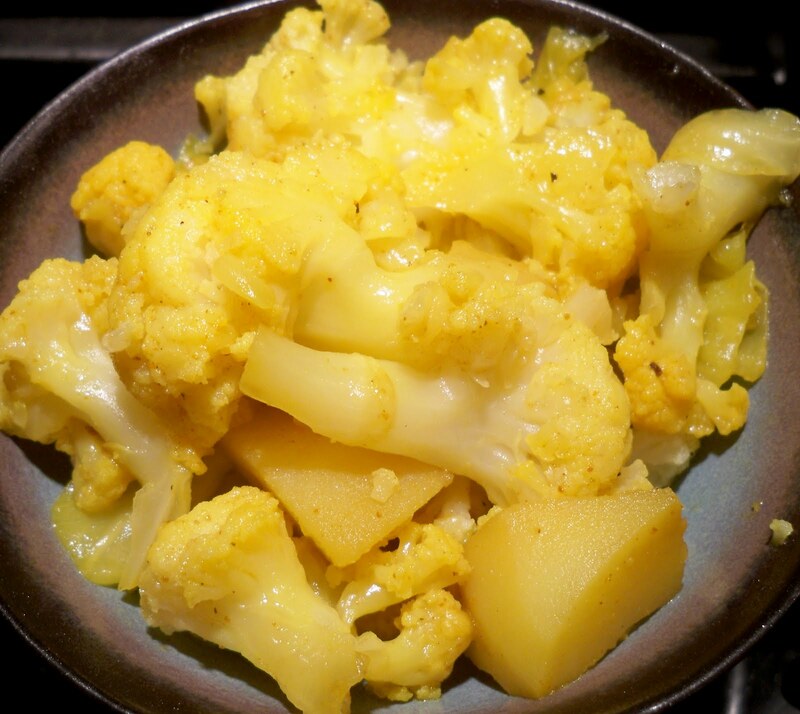 Let simmer for about 15-20 minutes, or until potatoes and cauliflower are soft. It’s that simple, but oh so delish! You can serve this alongside a main dish. For instance, we had a Moroccan Chickpea Stew with this the first time and it was wonderful. If you eat meat, it works with that too. 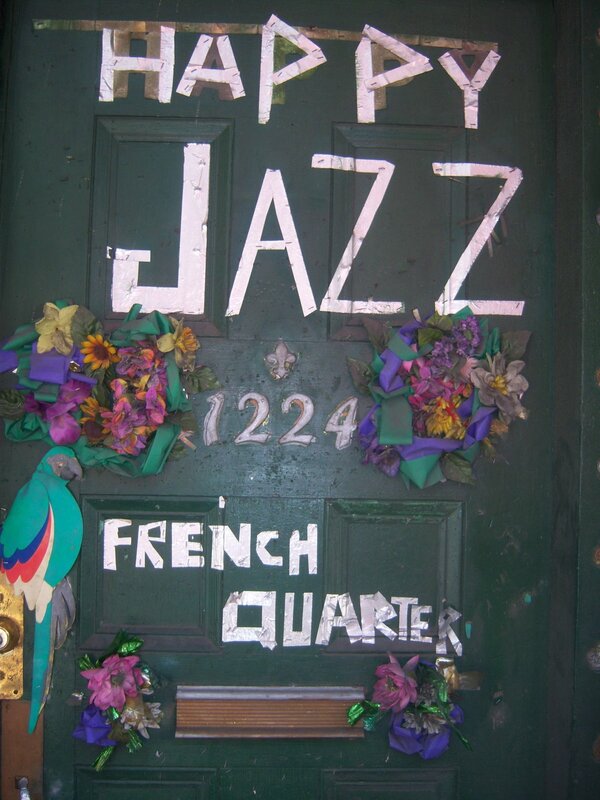 After a great visit to New Orleans, it’s nice to be home again. I made the spaghetti frittata while I was there, and it was yummy. Everyone ate it all up. There was one piece left the next morning and Daughter and I decided to share it. But we mistakenly took the cocktail sauce instead of the marinara sauce from my sister’s fridge and smothered it before noticing. Hmmm, not a great combo. But luckily there wasn’t that much left, although I hated not to eat it. I just couldn’t. So now that we’re back, Daughter and I are making the most of the Quorn Chicken Tenders. It’s basically like the Quorn roast, but small chicken-like chunks. They are wonderful. We found them in the Whole Foods in New Orleans and ate them for lunch twice. Tonight, we decided to try a Shepard’s pie with them. What a great idea! For this one, I used cauliflower, baby zucchini and Quorn tenders, topped off with mashed potatoes of course. We had to stop ourselves from eating the whole pie, it was that good. This picture doesn’t do it justice. We took a quick shot before devouring it. But trust me, it rocks. Give it a try. 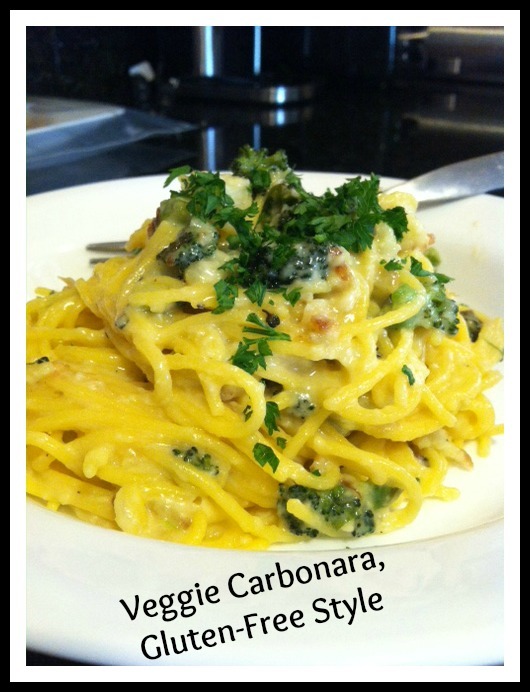 This one is easy and quick, but the flavors are so great. 1. 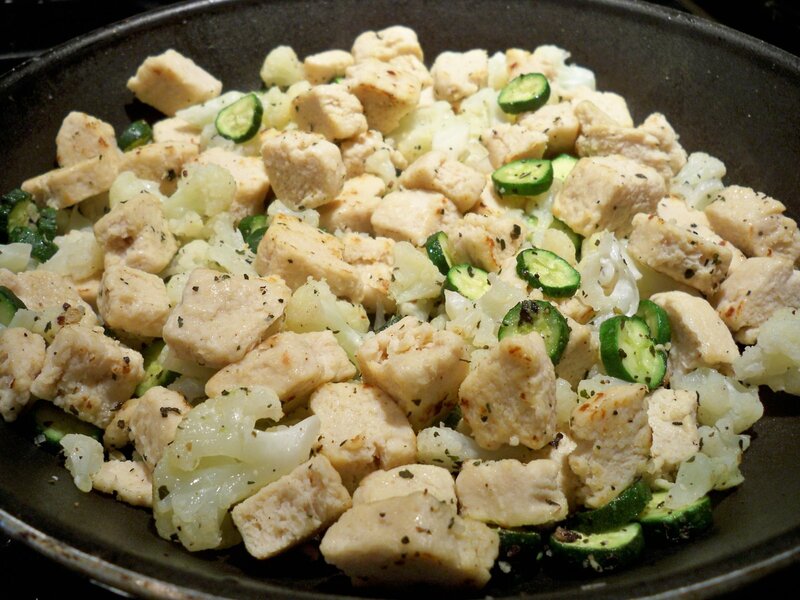 Add frozen Quorn to a hot pan with olive oil. Add garlic powder, basil, pinch of salt and pepper to tenders and let them brown slightly. 2. Place zucchini and cauliflower in a separate glass bowl and microwave for about 2 minutes until tender. 3. Add veggies to the tenders in the saute pan and mix. 4. Spray a tart pan with nonstick olive oil spray. Add Quorn mixture to bottom of pan and spread out to cover. 5. Add mashed potatoes on top of Quorn mixture and spread out evenly to the edges. 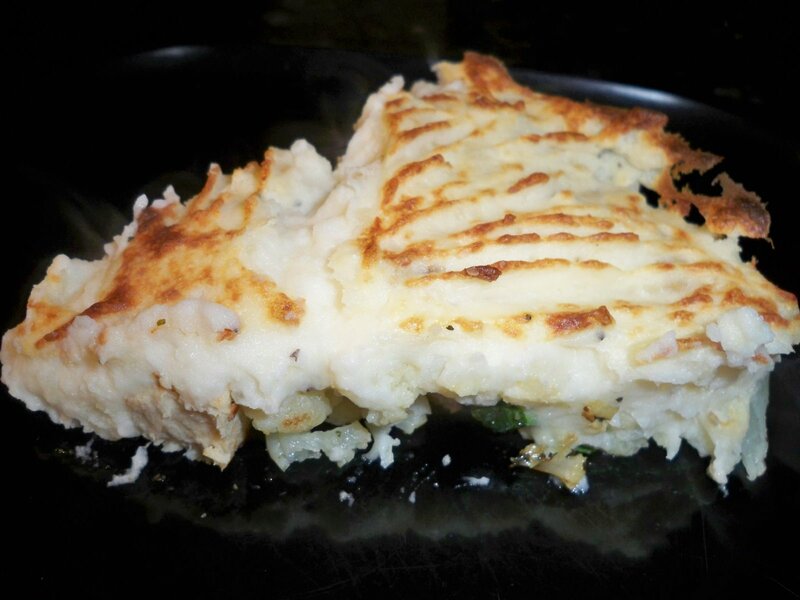 You can use leftover mashed potatoes, make your own, or even use pre-made. For a quick dinner, I don’t mind pre-made mashed potatoes. 6. Since everything is already cooked, you really don’t need to heat for long. If the potatoes are cold, put into a 375 degree oven for about 30 minutes. You may need to put it on broil for a few minutes to brown up the top. If the potatoes are warm, just place your pie under the broiler for about five minutes to brown up the top. 7. Let it sit for a few minutes to cool, then serve. So sorry it’s been so long since my last post. I had a great opportunity to edit a wonderful book. I was able to develop edit and copy edit and I love them both. It was great fun, but a lot of work, including late, late nights and long days. Way more than I anticipated. Which means I ate a lot of salads, Sunshine burgers and soups. The crockpot became our best friend for months. Even Daughter is getting amazingly good at stocking the crock. I’ll post her awesome black bean soup recipe soon. But today it’s all about curry. I am a very adventurous cook, but I’ve always been intimidated by curry. When my best friend told me how easy it was, I figured there was no reason to be afraid forever. Coconut milk makes me nervous for some reason. It’s a real unknown for me. But, I put my fears aside and here’s what I came up with on my first try. I loved it, and have enough for lunch tomorrow. I powered on the cayenne and Daughter decided on a tamale instead. Next time I’ll go a little easier on the cayenne so she can join me. I’m always a little heavy-handed on that spice. I just love kicking up a good sweat sometimes. My friend added a chicken breast to hers. 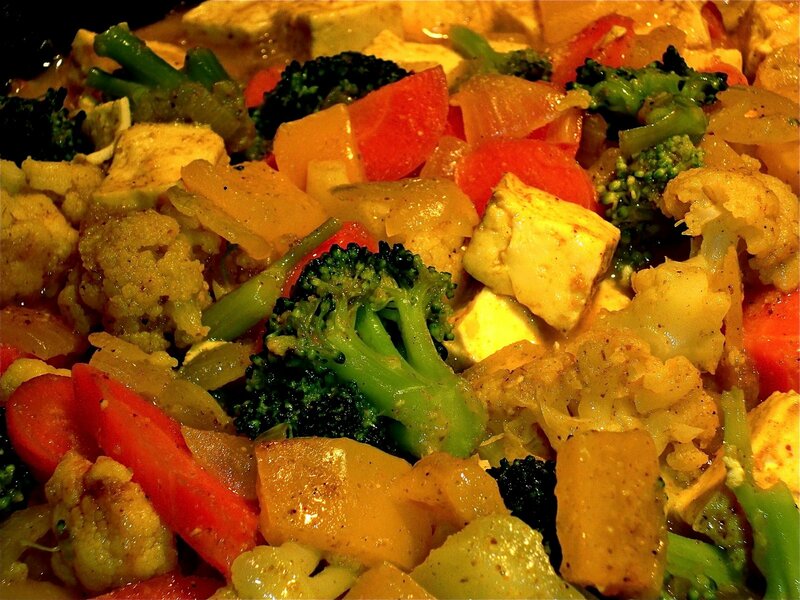 Of course, that’s not an option for me, being vegetarian and all…so I added tofu. But dear chef, it’s all up to you. Mix and match the veggies you like. 1. Put olive oil in a hot skillet (large) and add the onion. Saute for a few minutes until soft. 2. Add pepper and carrots and cook for about another 5 minutes. 3. Add cauliflower and broccoli and saute another few minutes. Add a few tablespoons of water if the pan is too dry. Cover. 4. Once veggies are softened (but not mushy) add tofu and curry powder, cayenne, garlic, salt and pepper. Stir. 5. Let the veggies and tofu soak up the spices for a few moments, then add the coconut milk. Mix and cover for about 8-10 minutes on low heat to give the flavors time to mingle and marry. 6. Test the curry and add more cayenne or curry, however you want it to taste. Being a vegetarian, and gluten free, means I eat a lot of veggies and starches. I try not to eat potatoes and rice every day, but that’s difficult sometimes. They are pretty easy to cook, especially when the rice comes precooked and the potatoes just pop in the oven. But today I decided to try something new. I’ve always loved shepherd’s pie, but I used to use a ground meat substitute made from wheat gluten, then green beans and mashed potatoes on top. Yummy…but no more. The meat is out, and the potatoes, although good every so often, are coming over much less often. 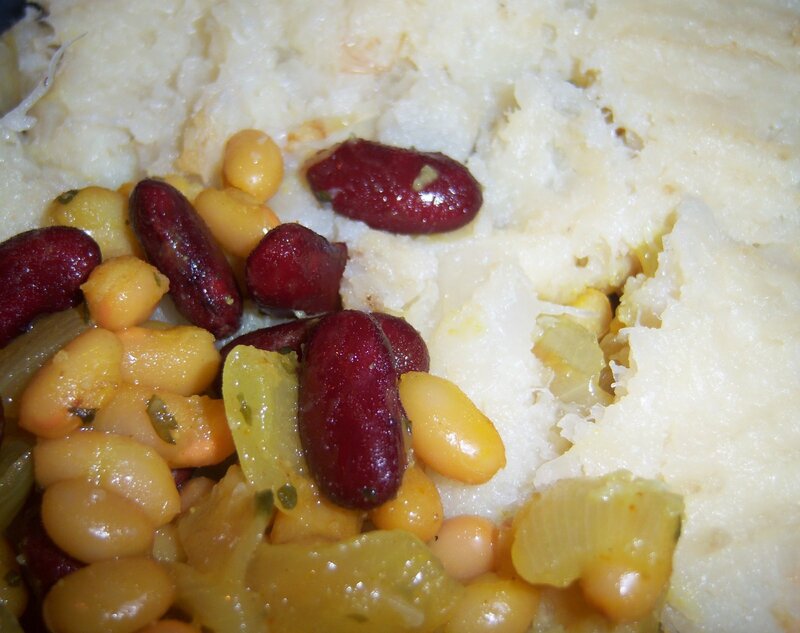 So tonight it was wonderfully spiced beans and onions on the bottom and mashed cauliflower on top. Yes, that’s right. I recently saw an episode of You Are What You Eat, a wonderful British show about eating right and losing weight. The host of the show uses no dairy, wheat or meat (only fish occasionally) to get people in shape. She had a recipe for vegetarian shepherd’s pie with mashed cauliflower on top, so I thought I’d make my own version. This was so tasty, and so wonderful, I think I’m putting this on my weekly rounds. If you want, you can add a little cayenne to the beans, but I skipped that step so Daughter could eat it. She doesn’t like spicy food (although Daughter #2 does). I think it would be great with a little spice, although I loved it this way just the same. I couldn’t stop eating it. I made a large, round casserole dish and I can share some with a friend tomorrow and have enough for lunch. Next time, perhaps I’ll add some red peppers or green beans. The possibilities are endless. 1. Steam the cauliflower until soft. I use an electric veggie steamer, and it takes about 30 minutes to get it nice and soft. 2. While cauliflower cooks, saute onion in a little olive oil and salt until soft. 3. Add drained beans and spices. Cook for a few minutes to mingle flavors. 4. Heat oven to 375. 5. When cauliflower is done, mix in butter and about 2 tsp salt and mash with a fork. 6. Pour bean mixture into casserole dish (spray to keep it from sticking). 7. Pour cauliflower over beans and spread evenly to the edges. 8. Bake for 30 minutes, check and make sure cauliflower gets nicely browned.